Beautiful certificate (#A6 or lower)from the Rome, Watertown and Ogdensburgh dated in 1887. This historic document was printed by Franklin Banknote Company and has an ornate border around it with a vignette of a steam locomotive. This item has the signatures of the Company's President, Charles Parsons, Jr. and Secretary and is over 120 years old. The certificate was convertible into 1874 mortgage bonds. The certificate was issued to Charles Parsons & Co. This is the first time we have seen this series of certificate for sale. The Watertown and Rome Railroad Company was incorporated under an act of the legislature of the State of New York, passed April 17, 1832, chapter 173 of the laws of 1832, and its road opened September 18, 1851. On April 11, 1860, an act entitled "An Act to amend the charter of the Watertown and Rome Railroad Company," being chapter 273 of the laws of 1860, was passed by the Legislature of the State of New York, authorizing the Watertown and Rome Railroad Company to purchase, to hold, operate and own and annex to its own road all the railroad, property and franchises of the Potsdam and Watertown Railroad Company, which had been incorporated February 15, 1852, and its road opened June, 1857. 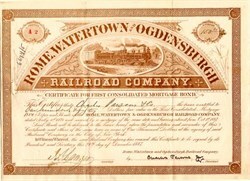 The purchase was made, in accordance with the terms of the act, on July 25, 1860, and subsequently, under authority of the same act, the Watertown and Rome Railroad Company, by a resolution of its board of directors, on July 10, 1861, changed its corporate title to Rome Watertown and Ogdensburgh Railroad Company, effective as of August 23, 1861. By an agreement of consolidation, dated October 22, 1874, between the Rome Watertown and Ogdensburgh Railroad Company and the Lake Ontario Railroad Company, which had been incorporated as the Lake Ontario Shore Railroad Company on March 27, 1868, road opened to Oswego in 1873, sold under foreclosure proceedings September 22, 1874, and reorganized September 29, 1874, as the Lake Ontario Railroad Company, the second company bearing the name of the Rome Watertown and Ogdensburgh Railroad Company was incorporated. This agreement was filed and recorded in the office of the Secretary of State of the State of New York on January 14, 1875, under authority of chapter 917 of the laws of 1869, passed May 20, 1869, and acts amendatory thereof or supplemental thereto. A third corporation bearing the same name was formed by an agreement of consolidation dated October 19, 1875, with The Syracuse and Northern Railroad Company, which had been incorporated February 25, 1868, under the name of the Syracuse Northern Railroad Company, its road opened in 1872, sold under foreclosure proceedings July 31, 1875, and reorganized September 22, 1875. This consolidation was under authority of chapter 917 of the laws of 1869, passed May 20, 1869, and acts amendatory thereof or supplemental thereto, and was filed in the office of the Secretary of State of the State of New York, December 23, 1875. The final company was formed by an agreement of consolidation dated March 14, 1885, with the Oswego Railroad Bridge Company, a corporation chartered April 22, 1872, and filed and recorded in the office of the Secretary of State of the State of New York on April 20, 1885, under authority of chapter 917 of the laws of 1869, passed May 20, 1869, and acts amendatory thereof or supplemental thereto. On August 7, 1889, the Norwood and Montreal Railroad Company, incorporated March, 1884, and its road opened September, 1886. On the same date, the Syracuse Phoenix and Oswego Railway Company, incorporated February 16, 1885. This company was formed on April 22, 1886, by consolidation of The Syracuse Phoenix and Oswego Railway Company (incorporated February 16, 1885, as a reorganization of The Syracuse Phoenix and Oswego Railroad Company, incorporated June 10, 1875, by consolidation of The Syracuse North Western Railroad Company, incorporated September 19, 1874, and Syracuse Phoenix and Oswego Railroad Company, incorporated November 29, 1871, sold January 31, 1885) and Fulton and Oswego Railroad Company (incorporated December 18, 1885). On April 28, 1890, the Rome Watertown and Ogdensburg Terminal Railroad Company, incorporated June 22, 1886, and opened in 1887. This company was formed by merger on February 21, 1888, of the Windsor Beach and Ontario Railroad Company (incorporated November 30, 1887) and the Rochester and Lake Beach Railroad Company (incorporated February 1, 1888) the latter company having, on August 5, 1887, purchased the Rochester and Ontario Belt Railway Company, which was incorporated January 31, 1882. Carthage Watertown and Sockets Harbor Railroad Company, The Niagara Falls Branch Railroad Company, Oswego and Rome Railroad Company, The Utica and Black River Railroad Company. The Rome Watertown and Ogdensburg Railroad was leased for the term of the corporate existence of the lessor company to The New York Central and Hudson River Railroad Company March 14, 1891, the consideration being an annual cash rental of $15,000, to be reduced after April 1, 1901, to $7,000; a guaranteed dividend of five per cent per annum on the capital stock; and all interest on outstanding mortgage bonds. The lessee company assumed all leases held by the lessor company. Consolidated into The New York Central and Hudson River Railroad Company April 16, 1913.